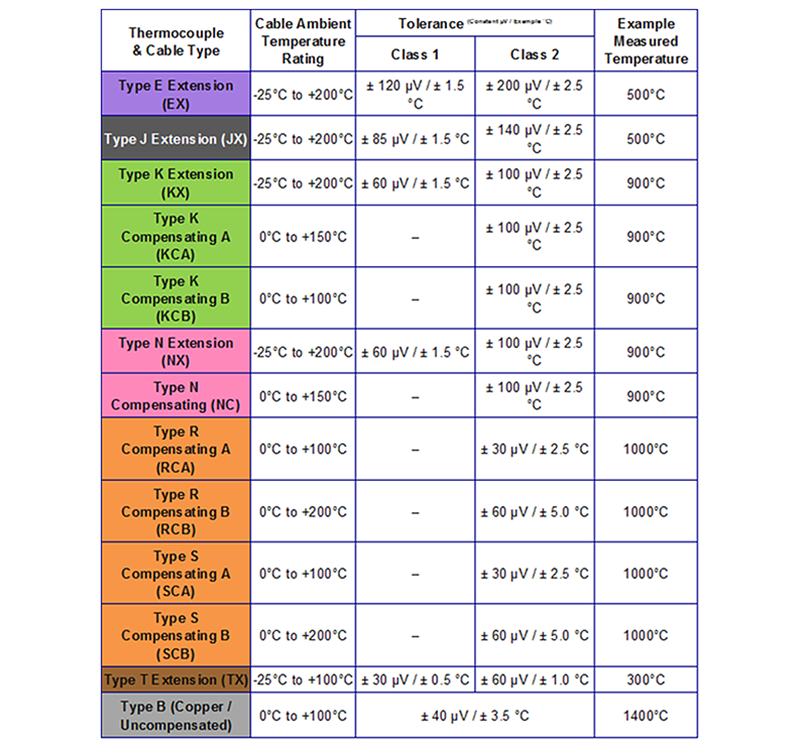 In our thermocouple technical reference section you will find resource material covering all aspects of thermocouples, from basic theory, product section to accuracy, colour code and output reference charts. If you have a question that isn't answered here, why not ask us via the contact form or call us. 6a. Why use Mineral Insulated Thermocouples? 7. What different types of Thermocouple are available? 15. What is an IP rating? 1. What is a Thermocouple (How they work)? A thermocouple is a sensor used to measure temperature in a number of processes. Thermocouples consist of two wire legs made from dissimilar metals which are fixed together at one end, creating a junction. When this junction experiences a change in temperature a voltage is created, this voltage can then be measured and referenced back to the temperature. This is also known as the "Seebeck Effect". Thermocouples are available in different combinations of metals, each with its own unique characteristics in terms of temperature range, durability, vibration resistance, chemical resistance, and application compatibility. • Base metal thermocouples or type K, J, T, & E are relatively low cost and therefore the most popular thermocouples, they are commonly used in a broad range of low to medium temperature applications. 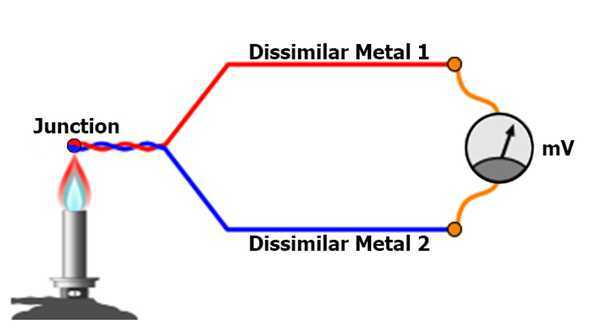 • Noble metal thermocouples or type R, S, and B have greater resistance than base metal thermocouples, however they have platinum conductors, making them far more expensive. They are commonly used in high temperature applications. 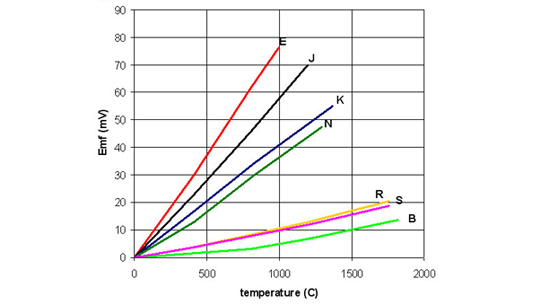 The graph below shows the thermocouple characteristics and relationship of temperature vs. mV output for all main base metal and nobel thermocouple types. This shows that Thermocouple Sensors have a relatively linear output. A thermocouple construction consists of two conductors welded together at the measuring point and insulated from each other along the length, which will usually have an outer protection sheath. Materials such as PVC, silicon rubber, FEP or PTFE insulators are most commonly used in applications up to 250°C, glass fibre or ceramic is used for temperatures above 250°C. For medium range temperatures (400 to 1200°C) the thermocouple protection sheath is often a metal such as stainless steel or alloy 600 and can be a machined pocket, designed to fit into a particular process. At high temperatures normally above 1100°C ceramic sheaths are used. Often more consideration goes into selecting and designing protection sheaths than sensors as they are more expensive and must provide protection from chemical or physical attack. Sheaths are often made to order as they are designed specifically to fit into a particular process or application. Thermocouple probes are available with one of three main junction types: grounded, insulated or exposed as pictured below. • In an ungrounded or insulated probe the thermocouple junction is isolated from the outer sheath material, this reduces any electrical interference and provides a stable reading but results in a slower response time and is often more expensive than grounded or exposed alternatives. • At the tip of a grounded thermocouple, the thermocouple junction is physically attached and is an integral part of the outer sheath. Response time is faster than that of an ungrounded junction as a result of good heat transfer from the sheath to the thermocouple junction; however readings can sometimes be unstable. 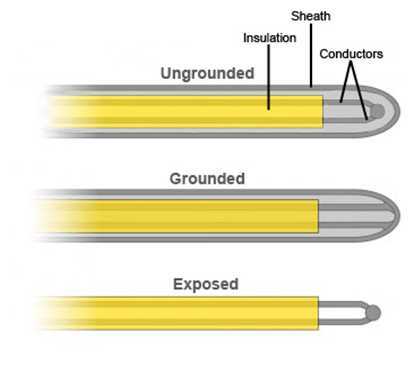 • An exposed junction either has no outer sheath or the thermocouple junction extends beyond the sheath. They are not recommended for use in corrosive environments but offer a very fast response time at a low cost in the right application. Mineral insulated thermocouples consist of an outer metal sheath that houses the thermocouple conductors; the sheath is then filled with a highly compacted magnesium oxide powder to prevent the conductors contacting at any point other than the fixed junction. This construction allows the sheaths to be bent or formed to shape as required by the user, but remain rigid during use. The whole assembly is hermetically sealed giving the conductors full protection from the operating environment. Available in 2 core (simplex) or 4 core (duplex) with a range of outer sheath materials including Grade 25/20 (310) stainless steel (corrosion resistant and suitable for use in sulphur bearing atmospheres), Alloy 600 (severely corrosive atmospheres to high temperatures) and Nicrobel D (recommended with type K and N thermocouples with good high temperature strength and excellent performance in oxidising, carburising, reducing and vacuum atmospheres). 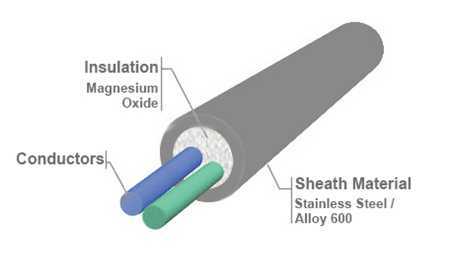 The high density of the mineral powder promotes rapid heat transfer between conductor and sheath. Mineral insulated cable is highly flexible and can be formed in to angles and shapes to ensure a perfect fit in the application. This also allows easy installation in locations where access is difficult. Mineral insulated sensors are a popular choice as they have a very wide temperature range. Fire-proof and can be exposed to considerably higher temperatures than synthetic sheath cables. The construction of the cable guarantees a long conductor life, due to the sheath and insulating powder protecting them they are able to withstand environmental conditions such as corrosion. Mineral Insulated Thermocouples can be bent in to many elaborate shapes. However, there is a minimum bend radius, which is 3 times the cable diameter. The above image shows a 3mm diameter MI cable at its minimum bend. To calculate the minimum bend radius you simply multiply the diameter of the cable by 3, therefore the minimum inside radius of a bend for 3mm cable must be 3 x 3 = 9mm. To calculate the circumference (18mm in fig 1) simply multiply the radius (9mm in fig 1) by 2. This is the minimum size of former you would have to use to form your MI cable in to shape. We manufacture a wide range of thermocouple sensors for industrial temperature measurment in type K, T, J, N, R, S & B in accordance with IEC584 using only Class 1 materials. A Thermocouple can be as simple as a bare wire sensor right up to a pure Platinum ceramic sheathed type R assembly for high temperature applications. Whatever your needs, Sterling Sensors will be able to provide a thermocouple for your application. Wire Thermocouples are fairly simple sensors, they offer a very fast response time at a low cost but are generally not suitable for use in industrial applications due to the majority of wire sensors being 'exposed'. Wire thermocouples are ideal for temperature measurement applications such as test and measurement, temperature mapping and OEM applications. If you are looking for a low cost basic sensor for general purposes, wire thermocouples are a good place to start. A selection of surface thermocouples for permanent or temporary temperature measurement available for use on many applications including Research and Development, HVAC, Plumbing, Air conditioning and Temperature Mapping. Surface Thermocouples are very popular as they can be used on many types of surfaces including uneven and circular surfaces, they are also very simple to use and are generally very easy to replace and position. 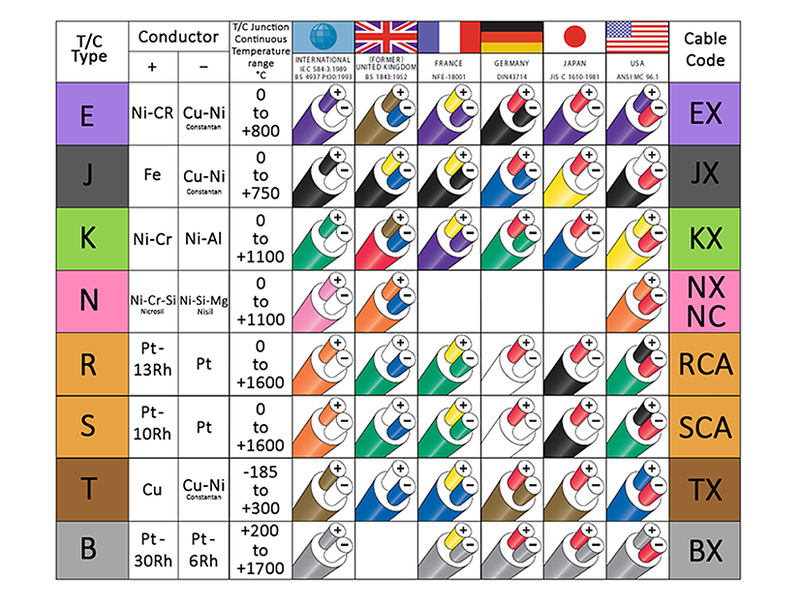 Although many of our sensors have more than one use, this range of sensors is our most diverse. They include bayonet thermocouples for the plastics industry, load probes for Pharmaceutical and Autoclave applications. And various thermocouples, such as washer, leaf and bolt probes for general purpose temperature measurement. Our standard range of Mineral Insulated Thermocouples are shown below, however if you need something specifically to suit your requirements contact us as we also manufacture to order. Mineral Insulated thermocouples are robust, flexible, can be made in long lengths and with a broad range of diameters. Sterling Sensors manufacture a wide range of handheld thermocouple sensors for use with digital handheld thermometers for surface, air or insertion temperature measurement in various applications such as food, catering, beverage, cold storage facilities or enviornmental in calibration type K, J & T. We also manufacture handheld Pt100 RTDs with custom made products available on request. When selecting the right thermocouple sensors, there are many things that need to be considered. Customers often come to us with a drawing, specification, photo or just an idea of what they want and we generally take it from there. By asking a few questions we can normally work out what thermocouple you want. However, in many cases our customers are left to source items with minimal information provided to them from a third party customer or engineer within the organisation. Alternatively, you may simply have a new application which needs temperature measurement and have never purchased this type of product. Again, we are able to help. Below we discuss the 7 steps you need to consider in order to get the right thermocouples for your application. Do you know the thermocouple type you need? Such as type K, T, or J. If not, this is the first thing you need to consider. Whatever you are connecting the thermocouple to normally determines this. Also, this will determine the thermocouple accuracy. What is being measured? Is the thermocouple measuring a liquid, surface or a gas? Does it have to sit in a pipe or a vessel or is it part of a machine or apparatus? What considerations need to be thought about? E.g. Does it need to be chemically resistant, IP rated, ATEX approved, food use, high vibration? How is the thermocouple fixed to the application, such as; wall mounted, hand held, outside or inside. Does it need a fitting to be held in place? (E.g. 0 – 1000 Deg C) This is the main limiting factor when choosing a thermocouple as it determines the materials used in the construction and also the calibration type in many cases. What are the length, diameter and size requirements? Does it need to be bent or extremely long? What is the thermocouple being connected to? Does it need a terminal head, connector, wire or transmitter? If you can answer these questions, then you should be able to determine the thermocouple you want. To help you, we have an easy to use questionnaire which can be completed and returned to us, or you can simply call or email us with your questions, we are here to help. A practical guide to help you choose the right product for your application. We have developed this questionnaire to assist customers in choosing the thermocouple they require. If you have limited or no experience with thermocouples this questionnaire is easy. It simplifies the process of selecting sensors by providing you with guidelines to gather your specification. It’s very useful for the likes of buyers and resellers that have very limited knowledge of sensors and are unsure on what information they need to provide. Each thermocouple type has different characteristics which determine its suitability for different applications. 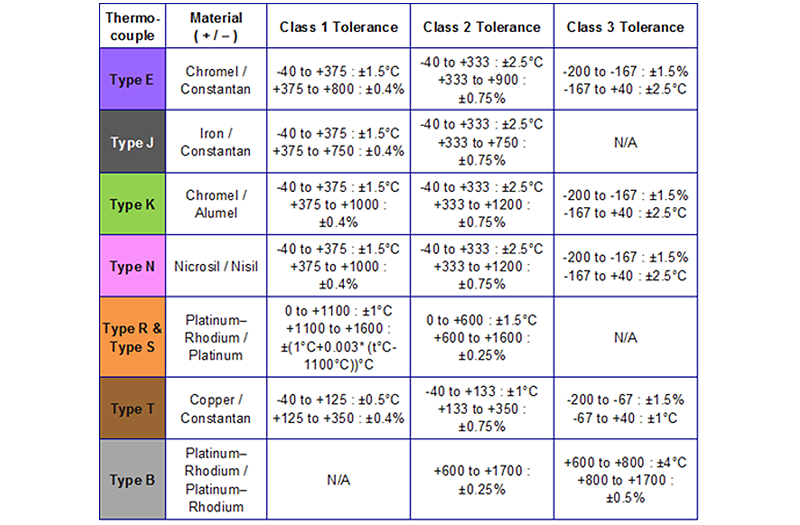 Our thermocouple information chart below displays temperature range, colour code and conductor material for each thermocouple type, making it easier for you to find the right thermocouple for your application. 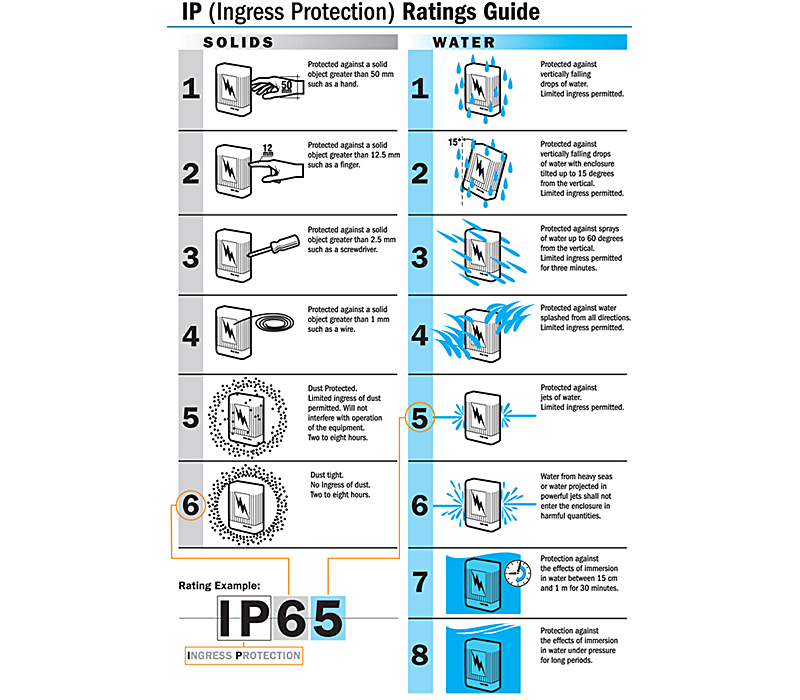 The IP Code, International Protection Marking, IEC standard 60529, sometimes interpreted as Ingress Protection Marking, classifies and rates the degree of protection provided against intrusion (body parts such as hands and fingers), dust, accidental contact, and water by mechanical casings and electrical enclosures. It is published by the International Electrotechnical commission (IEC). 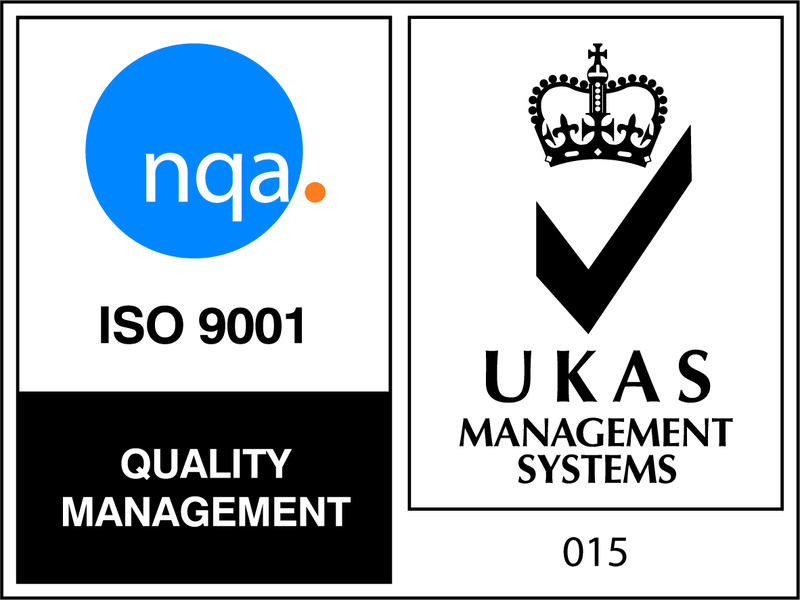 The equivalent British standard is EN 60529. The standard aims to provide users more detailed information rather than vague marketing terms such as "waterproof". 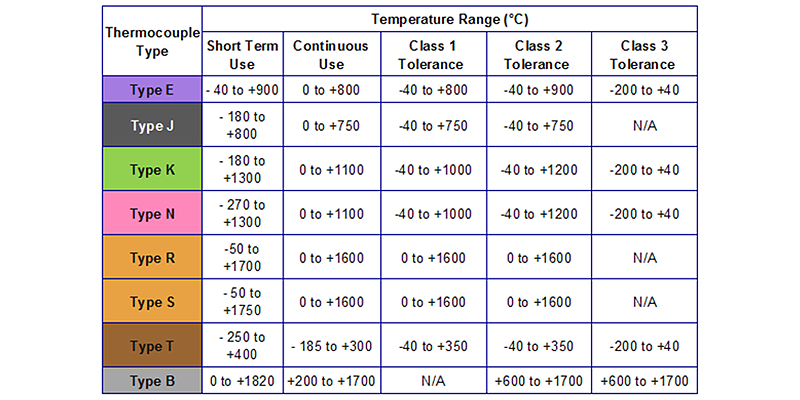 Many of our Thermocouple Sensors are supplied with heads that are IP rated, the following table shows what the codes mean and how they are made up. Click here to view all of our IP Rated Temperature Sensors. Thermocouple assemblies can be supplied with a number of fittings and accessories to suit any application. Termination options include plain or threaded pot seals, extension or compensating cables or standard and miniature plugs and sockets. Also, weather-proof, explosion proof, flip top or angle entry terminal heads allow for an easy connection to an instrumentation system. Various compression fittings can also be used to fix the thermocouple into the application or process entry.